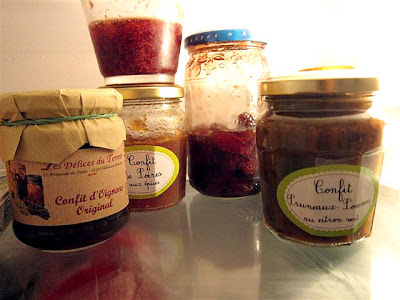 Certaines personnes/some people have a lot of confiture/jam in their refrigerators. Certaines personnes think it's perfectly OK to go out and leave guests alone in their apartment completely surrounded by jam jars. Certaines personnes happen to be on vacance in Barcelona and are not going to see this post. 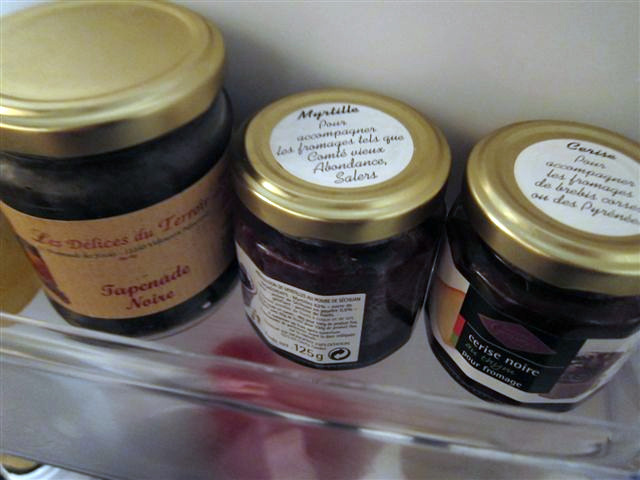 These certaines personnes have tremendous amounts of jam in their frigo. And lurking on their pantry shelves. Certaines personnes have uncles who make their own honey/miel, so don't even think of giving them a fancy jar of honey when they run out. No way! 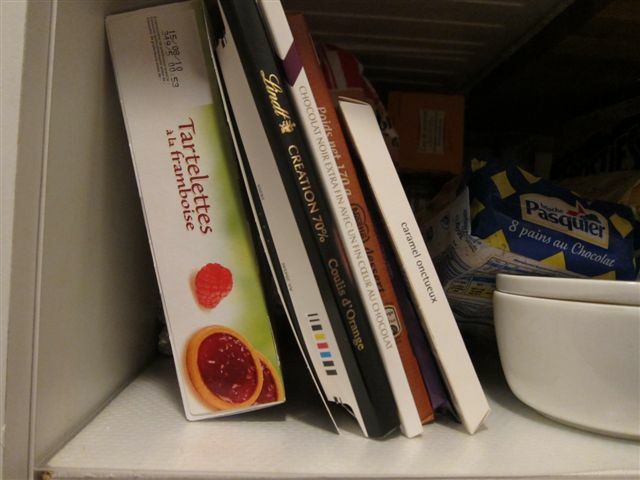 Certaines personnes have boxes of jam tartelettes just hanging around. Certaines other personnes can only get up close and personal with a jar of jam when it's through a camera lense and behind glass barriers. 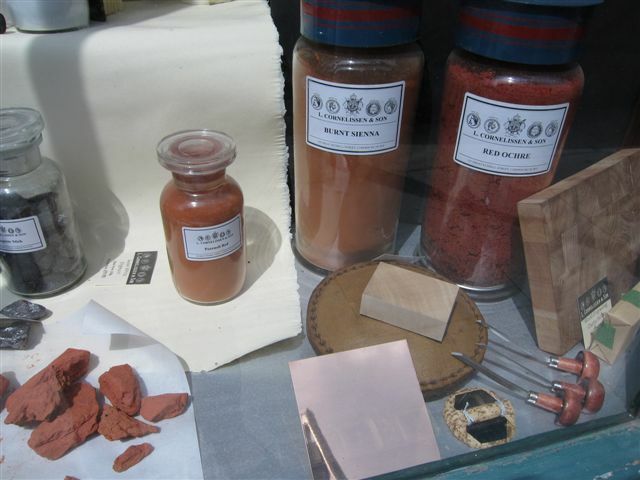 They are allowed to get chummy with jars of paint pigment. BUT THAT IS IT. PERIOD. It's best to keep certaines personnes at a distance from the jam jars. They have been known to attack a jar of jam with a spoon and not stop till they hit bottom. Certaines personnes were contemplating taking these mini jam jars home, but thank gawd they were too embarrassed to do so. 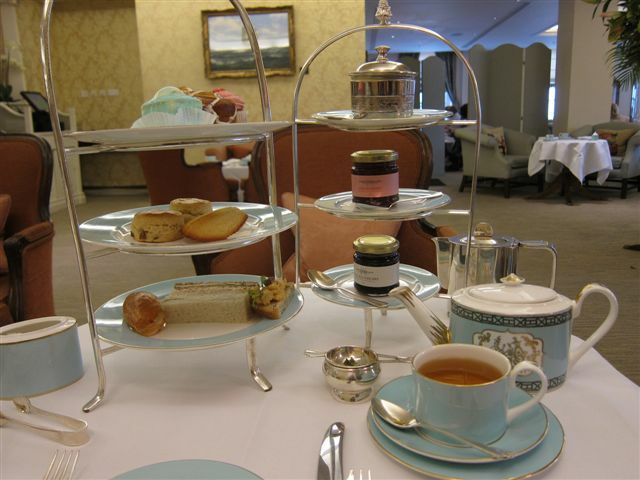 They made the fatal error of going to the top floor at F&M for a tres cher afternoon tea. Certaines personnes nearly missed their plane lingering over jam at CDG admiring gazillion jam jars. 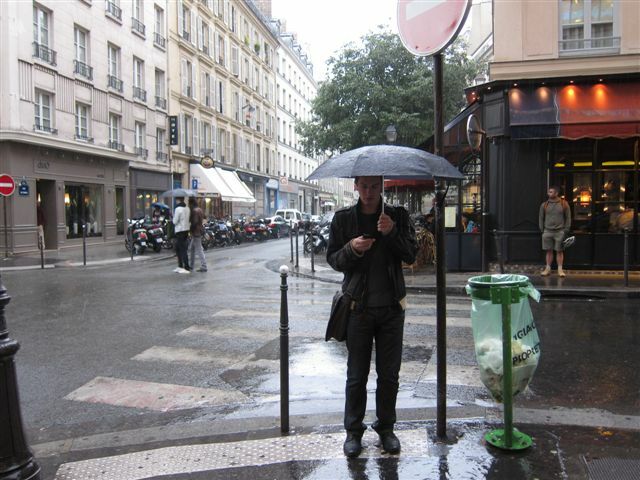 Certaines personnes are late posting today but they'd much rather be in Paris, even if it is raining on Bastille day. I love love love your pictures. I got to go to Paris in May and to be brought back every morning, is a treat. 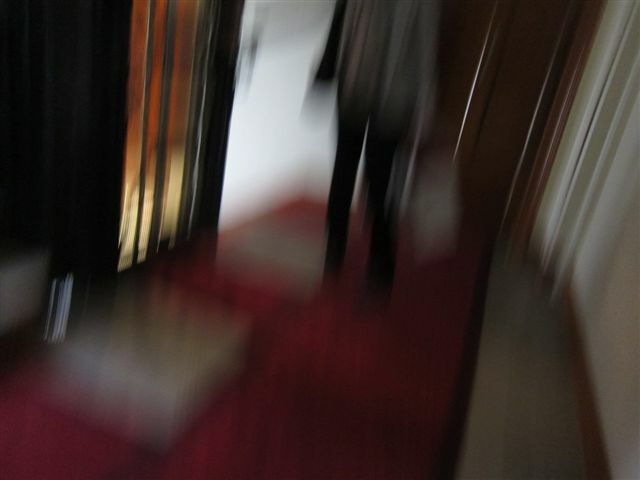 Walking is my best mode of promenading around. Oh! 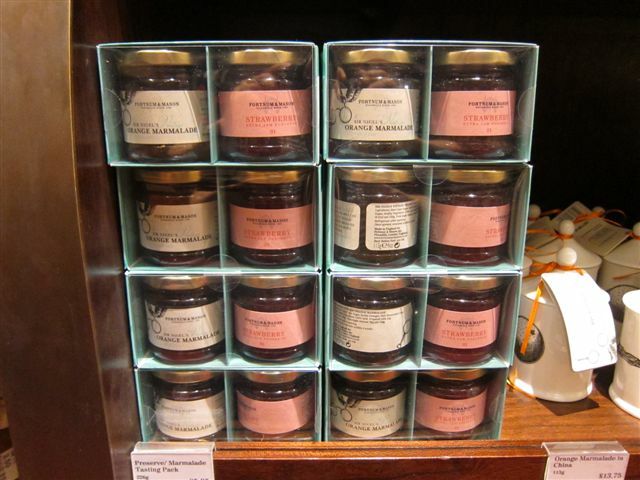 I squealed when I saw those little F&M jars of jam! Here I am in France, loin de Londres, ma ville natale, and feeling homesick. 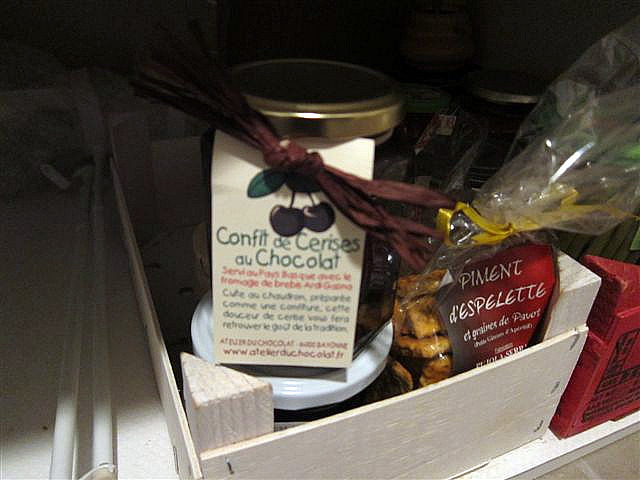 I did, however, receive a F&M hamper at Christmas with some of those same jars. Saved the labels, of course. You're longing for Paris, I'm here longing for London. I hope you get back to Paris soon! certaines personnes have an INSANE about of jam in their refrigerators!!! No wonder certaines other personnes went completely nutz! Carol, you are very bad to my diet! I just want to attack the jam in my frigo, now! Who cares! Life is short, let's eat! Hope you brought with you some of those jams?! Certaines personnes' fridge looks an awful lot like ours at home--we tend to have several different confitures going at once. Yum. actually the bikes are a nice way to get around but they are NOT good for taking pictures cause you're way distracted with not wanting to kill or be killed on them! hope certaines personnes are also enjoying their holidays in spain.......Nice Life! Certaines personnes are a canard chanceux!!! 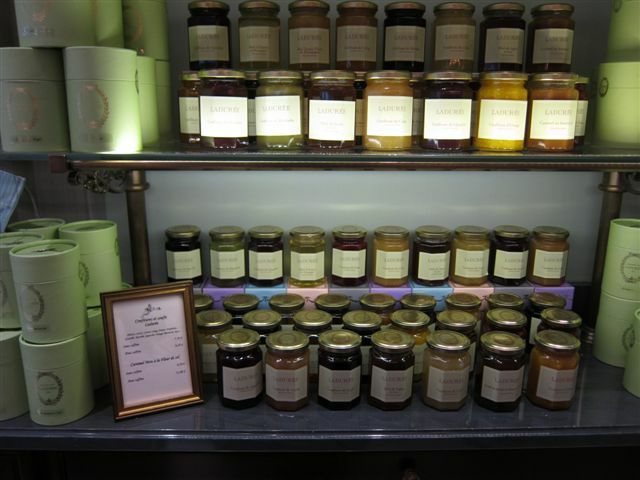 ... OMG, I ALWAYS take the tiny jam jars .. and OMG Laduree has a shop in CDG !!!! ... great post today ..
At least you walllllllllllllllllllllk everywhere. Jam infiltrates the brain and turns it to jelly. Speaking as a completely unqualified legal advisor, I believe Certain Personnes would be entitled to cry "Entrapment" in any of the abundantly illustrated situations....after all, it is only human or should I say personne-like to partake of those delectables laid out before you COMPLETE WITH IMPLEMENTS!!!! That's your story; stick to it. I love your blog, paintings, and photos. I lived in Europe for over 20 years, and whilst I am happy to be back, I miss certain things. Paris is one of them, although I am happy to be close enough NYC, to visit a few times a year. I keep in touch with a lot of my friends abroad through facebook. I am certain that your blog would be scooped up and loved by many people. Thought I would make the suggestion. Please keep writing, painting, photographing, and blogging - it's wonderful. I do Flickr Etsy, Blogger, Picnik, Zazzle and am trying to write a 'book' of sorts. THAT place is a veritble land mine for anyone with a jammy addiction. I also love jams, right now I have marionberry, raspberry from Oregon and chokecherry from Minnesota. I rather be in Paris too!!!!!! Do show us more if you can. Love your blog it start my day with a smile. Bonne Fete National a la France. I ALWAYS ENJOY YOUR HUMOR,MODESTY,WIT,AND TALENT. IT IS ALWAYS A FUN TIME TO VISIT WITH YOU IN YOUR WORLD! Certain personnes, indeed. Oh Carol, how do you know zees personne vill not see eet. 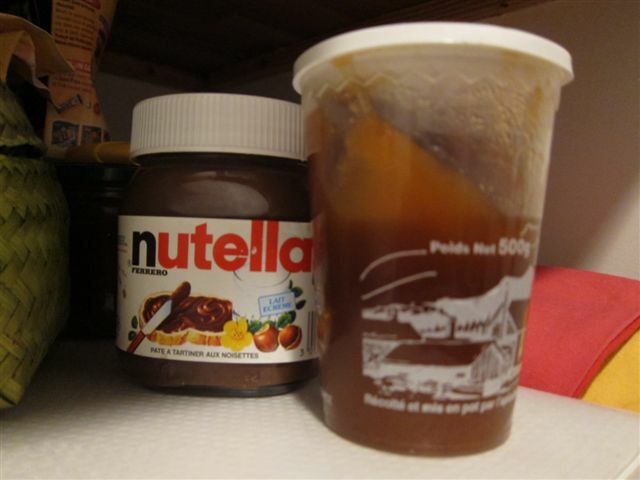 And there's Nutella, too. I'm on a strict no-no re: jams, sugary stuff (not mandated by me, it's for health reasons) & yowsa it's not easy. I have them pushed to back of fridge. Some in cupboards. Wah. OK, that's it. Maybe the person asking about velos meant les bateaux mouches? Even if touristy, I still love them because of Grant & Hepburn in Charade. MDR! j'adore cette poste. c'etait très créatif avec beaucoup de humour! that was selling Chocolate Soup at the Bastille Day celebration in New York last weekend). Thank you for introducing me to macarons. Now I understand what you're talking about! 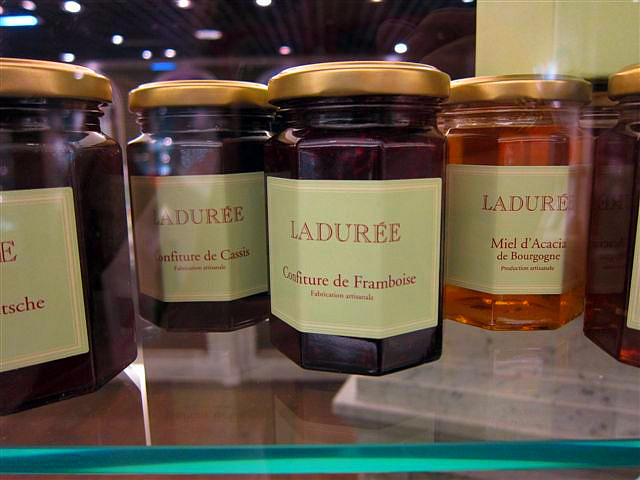 Better jam than Speculoos, my friend! I guess I am also one of those "certaines personnes" too. 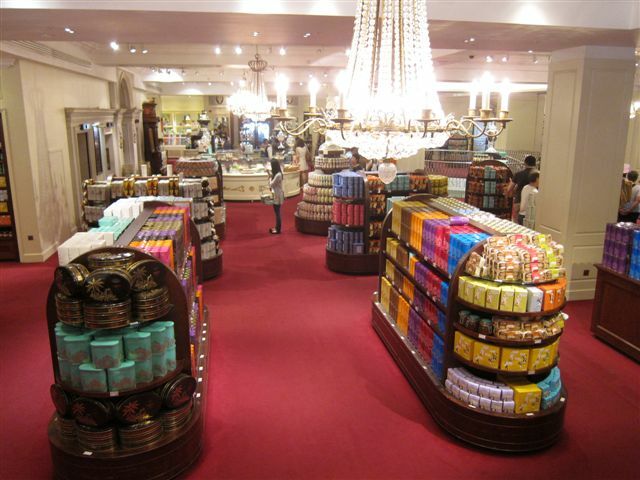 I sat at the same table at Fortum and Mason and had the same delicious (but overpriced tea!) that you did! Took the jam back to Paris where I was staying too! Hope to meet you one day - you need to have a show at the Alliance here in LA! Do U Shoot Yr Food?